Dr. Geoffrey Westrich is an accomplished and highly-respected orthopedic surgeon. Committed to providing the highest quality of care, he is Research Director of the Adult Reconstruction and Joint Replacement Service at the renowned Hospital for Special Surgery in New York City, where he sees patients. The Hospital is consistently ranked the #1 hospital for orthopedics nationwide by U.S. News & World Report. Dr. Westrich is a foremost expert in diagnosing and treating complex injuries and diseases of the hip and knee, including revision hip and knee replacement. Because he is highly specialized in these areas, Dr. Westrich is able to provide the highest level of care. Patients travel from around the country and around the world to see him for his special expertise, and he often takes on the most challenging cases – patients that other doctors decline to treat. Dr. Westrich is knowledgeable of the latest advances that will benefit patients and conducts research to advance the field. As a Professor of Clinical Orthopedic Surgery at Weill Medical College of Cornell University, Dr. Westrich trains other doctors. Dr. Westrich was also named president of the prestigious Eastern Orthopaedic Association in 2015. Before he became an orthopedic surgeon, Dr. Westrich received a Bachelor's degree in Engineering. Upon graduating from Tufts University School of Engineering, he was invited to join Eta Kappa Nu, the prestigious Engineering Honors Society. 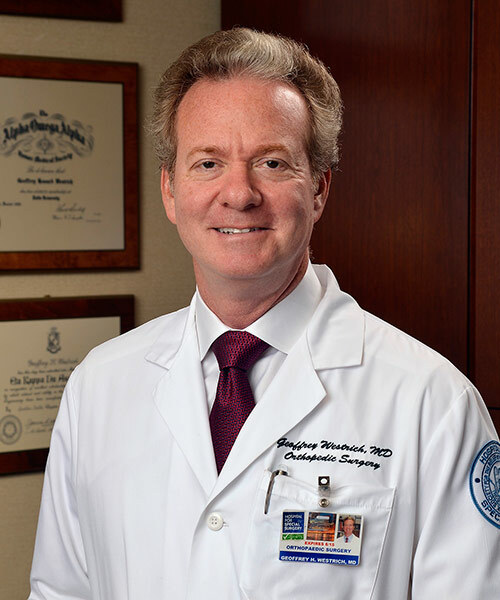 Combining his background in engineering with his orthopedic surgery training, Dr. Westrich has become a leading expert in hip and knee replacement surgery, performing approximately 500 procedures each year. His specialties include minimally invasive total hip and knee replacements, partial knee replacements, complex revision surgery, recall hip and knee surgery, arthroscopic knee surgery/ligament reconstruction, as well as fracture treatment of the hip and knee. With his degree in engineering, companies making hip and knee implants call on him for his expertise. He has worked with them to design new and improved joint replacements and surgical instrumentation. Dr. Westrich does not hesitate to take on the most difficult cases, including revision surgery when a hip or knee implant needs to be replaced. He has expertise in treating infections and other serious complications after joint replacement. He has enabled patients to overcome the most challenging problems when other doctors said there was no hope. With more than 20 years of experience, Dr. Westrich has performed thousands of surgeries, striving to treat his patients with compassion and respect at all times. He conducts research that will benefit patients and has written numerous articles for prestigious peer-reviewed medical journals. He has won awards for studies that have advanced the field of orthopedic surgery. His current research focuses on reducing the risk of blood clots and infection after surgery and on how to improve the lifespan of joint replacements. Dr. Westrich is named in America's Top Doctors, a guide book that seeks to identify the best specialists in the United States. According to the book's publisher, "these outstanding doctors represent the top one percent in the nation" in their respective specialties. Dr. Westrich has also been featured in the book, Top Doctors: New York Metro Area and in New York magazine's "Best Doctors" guide. The media often call on Dr. Westrich for his expertise. He has been featured in numerous reports.